Minori, which literally translates to small, was known as Rheggina Minor in olden times as it is situated on the banks of river Rheggina. Over a period of time, the city’s name changed to Minori. Still a hidden gem, Minori was once a favorite recreation destination among the Romans. Although a small town, it finds its place on the map as the hub of pasta and pastry production. Explore Minori’s ancient villa, visit lemon gardens and try limoncello – city’s famous liquer; and give in to gastronomic pleasures at the annual food festival – Gustaminori. Minori is approximately 11 kilometres away from Amalfi, if you drive down and makes for a perfect getaway for a day while at Amalfi. Some of the top attractions in Minori are - Basilica di Santa Trofimena, Villa Roma Antiquarium and Minori Beach. Best time to visit Minori, like its neighbouring cities, is anytime during the year. Although the peak season is from June to August. 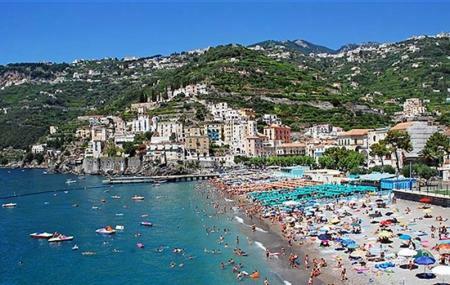 People normally club together Atrani and Municipal Museum Of Amalfi while planning their visit to Minori.